Sometimes Spider-Man's ally and sometimes his enemy, Felicia Hardy prowls the city as Black Cat. During Marvel NOW!, Black Cat's characterization took a pretty big hit: no longer was she a mischievious burglar who stole for fun; suddenly she was a bloodthirsty crime queenpin running New York's mob underworld and trying to kill Spider-Man. Yeah, that makes no sense. The excuse given was that she was mad that Superior Spider-Man had arrested her and ruined her reputation, but that's idiotic. Fortunately, Nick Spencer came up with something better: it's "One More Day"'s fault. Remember, Felicia and Pete used to date, so losing knowlegde of his secret identity Eternal Sunshine of the Spotless Mind-style severely messed up her brain, and she got a little unhinged for a while. They eventually worked it out. 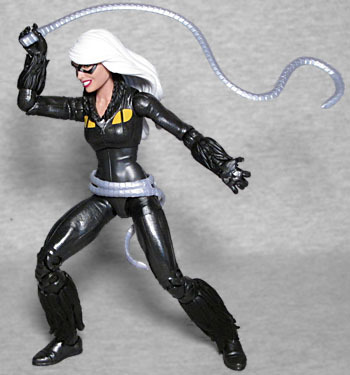 Black Cat is wearing her modern costume, which trades the white fur of the original for black. 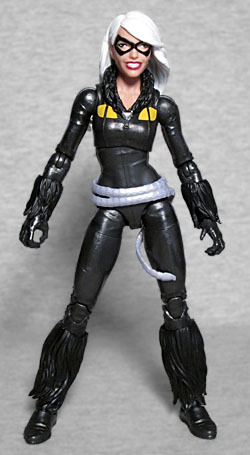 It also adds big yellow cat eyes by the shoulders, but this figure does them wrong. Look at the Minimate to see what they're meant to look like: farther out to the sides, and much more stylized. There should also be some quilted pads on the arms and legs, but these molds are reused from Black Widow, and she didn't have anything like that - the entire body is sculpted with seams and wrinkles that are fairly un-typical for a superhero outfit. Black Cat usually wears leather, but this costume must be made out of compression fabric, judging by how small her chest has gotten. She still wears the little black mask around her eyes, but her hairdo is less wild - it's just parted on the right and comed to the side. She's sculpted with a big smile, which looks fine from most angles, but there are a few where it simply appears that she's gritting her teeth. Still, it's nice to see a toy that's actually expressing an emotion rather than looking plain. The articulation is the usual, even though this is a new mold: head, neck, shoulders, elbows, wrists, chest, hips, thighs, knees, and ankles. She comes with her whip as an accessory, but that's a problem: her whip is formed from her belt, and the figure is also wearing said belt. It's a separate piece, but it's not removable, so it'll always be hanging about even when she's supposedly holding it in her hand. For comparison, imagine a Captain America toy that had his shield strapped to his back, but also came with another shield for him to carry around and throw. It'd be weird, right? Black Cat's Build-A-Figure piece is Kingpin's big right arm. But also his diamond-tipped cane, which is exactly the kind of thing Black Cat would want to steal. Smart! 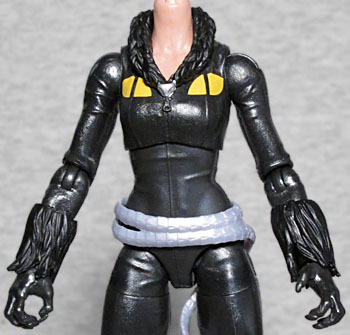 This could have been a really nice figure, a "must-buy Felicia," but given the incorrectly designed shoulder-eyes, the unavoidably doubled accessories and, yes, her mysteriously shrinking anatomy, this one just doesn't reach its full potential.